The human knee contains four types of ligaments. 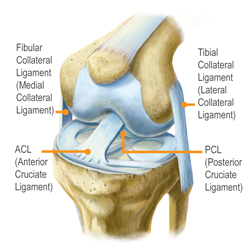 The anterior cruciate ligament (ACL), posterior cruciate ligament (PCL), medial collateral ligament (MCL) and the lateral collateral ligament (LCL). The cruciate ligaments located down the center of the knee, control the forward and backward movement of the shin. 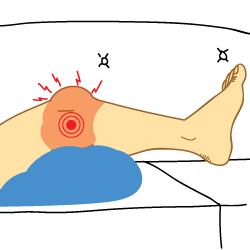 The ACL and PCL are arranged in a crossed formation. The medial and lateral collateral ligaments control the stability of the inner and outer knee, respectively. ACL tears are one of the most common knee injuries with over 100,000 ACL tears in the US occuring annually. Most ACL tears are a result of landing and planting in sports where pivoting happens either with or without contact. Complete tears require surgery as the ACL is crucial for stabilizing the knee when turning or planting. Reconstruction is most commonly done by autograft, meaning the tissue used for the repair is from the patient's body. 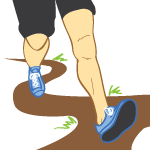 The two most common sources for tissue are the patellar tendon and the hamstring tendon. 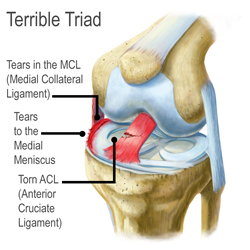 Tearing of the ACL can sometimes be a part of a knee injury known as the 'terrible triad'. This consists of the simultaneous tearing of the ACL, MCL and medial meniscus. Women have been known to suffer ACL injuries more frequently than men. Current research gives some explanation for this. The joint which the ACL passes, along with the actual size of the ACL, is significantly smaller in women than in men. This makes it more susceptible to damage. Along with these aspects, women tend to not activate their hamstring muscles as much as their male counterparts during certain movements causing less stability in the knee joint. Ligaments are elastic bands of tissue that connects bones, providing stability and strength. Ligaments are typically torn through sudden twisting movements when the knee and feet don't cooperate with each other. Although pain isn't always immediate, a torn ligament can be heard, very similar to a popping sound. Three bones meet to form your knee joint, they are the thighbone (femur), shinbone (tibia), and the kneecap (patella). 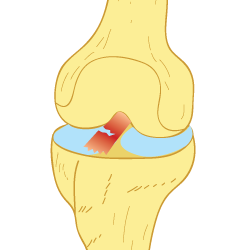 The kneecap sits in front of the joint to provide some protection. Bones are connected to other bones by ligaments. There are four primary ligaments in your knee. They act like strong ropes to hold the bones together and keep the knee stable. About half of all injuries to the ACL occur along with damage to other structures in the knee, such as articular cartilage, menisucs, or other ligaments. Collateral ligaments are found on the sides of your knee. The medial collateral ligament is on the inside and the lateral collateral ligament is on the outside. They control the sideways motion of your knee and brace it against unusual movement. Cruciate ligaments are found inside your knee joint. They cross each other to form an 'X' with the ACL in front and the PCL in the back. The crucaite ligaments control the back and forth motion of your knee. To visualize properly, posterior meaning near the hind end of the knee in this case, with anterior meaning near the front of being situated in the front of the body. The ACL prevents the tibia from sliding out in front of the femur, as well as provides rotational stability to the knee. There are two different ways to attack ACL surgery. There is the reconstruction process or the repair process. Although they both sound similar, they are in fact quite different. ACL reconstruction surgery uses a graft to replace the ligament. The most common grafts are autografts, using part of your own body, such as the tendon of the kneecap (patellar tendon) or one of the hamstring tendons. Another choice is allograft tissue, which is taken from a deceased donor. 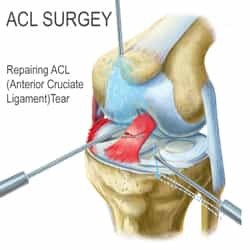 ACL repair surgery is typically used only in the case of an avulsion fracture (separation of the ligament and a piece of the bone from the rest of the bone). In this case, the bone fragment connected to the ACL is reattached to the bone. The surgery is arthroscopic, meaning that a tiny camera is inserted through a small surgical cut. That camera sends video to a large monitor so the surgeon can see any damage to the ligaments. In the event of an autograft, the surgeon will make a larger cut to get the needed tissue. 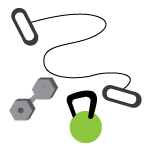 In the event of an allograft in which the material is donated, this is not necessary. The surgeon will make holes in the patient's bones to run the tissues through, and the tissue serves as the patient's new ACL. Recovery time ranges from six to ten months. A graft taken from the tendon at the front of the knee below the kneecap (patellar tendon) will include two small pieces of bone called "bone blocks" on the ends of the tissue. One piece of bone is taken from the kneecap and the other piece is taken from a part of the lower leg bone near the knee joint. This type of graft allows better healing because the tendon is still attached to its original bone, and the pieces of the bone just need to heal into their new locations. If the autograft comes from the hamstring, bone blocks are not taken. This type of graft may allow the knee to look more normal after it heals, because the tendon from the front of the knee isn't used. It is also easier to add extra tissue from a deceased donor (allograft) to this type of a graft. The graft is pulled through the two tunnels that were drilled in the upper and lower leg bones. The surgeon secures the graft with hardware such as screws or staples and will close the incisions with stitches or tape. The goal of ACL surgery is to restore normal or almost normal stability in the knee and the level of function you had before the knee injury, limit loss of function in the knee, and prevent injury or degeneration to other knee structures. Not all ACL tears require surgery. Fully torn ligaments (ruptured) in the knee cannot heal on its own due to lack of blood supply. 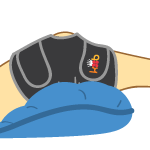 Immediate relief can be provided in the form of ice packs and cold compression to reduce swelling and protective knee braces to use while exercising to reduce the risk of agitation. Once inflammation has subsided, to help stimulate optimal blood flow, medical devices have proven to be superior in decreasing healing times. Even though the ligaments don't have an ample amount of blood flowing around them, increasing blood flow to the knee has been proven to reduce the need for surgery in patients where the ligaments are not ruptured. Long term relief can occur through the process of strengthening the surrounding muscles. Doing so can help make up for the instability of the torn knee ligament. Non surgical treatment involves reducing swelling by icing and rest. Wear a leg brace to provide support when walking. Crutches may be helpful to prevent awkward limping that strains the back or the other leg. Crutches are available at large drug store chains at very low cost. Increasing your range of motion with the help of a physical therapist, keeping in mind that it will take six to eight months to recover. Strengthening muscles around your knee, including the hamstring, quadriceps, calf, hip and ankle. Reconstructive surgery should be an option only when all other treatment modalities have been exhausted. If the swelling hasn't subsided prior to surgery, the surgery date may be rescheduled. While waiting for surgery, wearing a supportive leg brace will help with walking, and completing daily tasks without further injury. Research should be done if a different type of graft is preferred. The most common are patellar tendon graft, hamstring tendon graft or allograft. An allograft is taken from a cadaver. Synthetic grafts have also been used, but have a higher rate of failure. 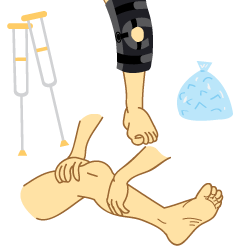 After an acute injury, you will almost always have to stop the activity you are doing, but you may be able to walk still. Other health problems can cause symptoms like those of an ACL injury, including a bone break or injuries to the meniscus and other ligaments in the knee. An ACL tear most often occurs during sports or athletic events. About 80% of the ACL tears occur without contact with another athlete. The most typical story is an athlete suddenly changing direction (cutting or pivoting) and feeling their knee give out from under their body. People who suffer an ACL tear usually report hearing a "pop" at the time of injury. Most people are surprised at how loud this can be, and many bystanders have heard this from the sideline of a football or soccer game. Even if you don't hear the pop, usually people will feel the sudden shift in their joint. The ACL is critical to the stability of the knee joint, and when an ACL tear occurs, the joint is usually unstable. This means that the knee joint has a tendency to give out. Giving out or instability usually occurs with cutting or pivoting movements which are common in many sports. 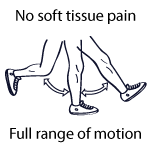 However, in some people with an ACL tear, instability can occur with even simple movements while walknig or getting into a car. 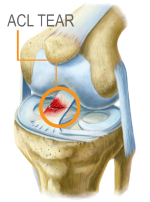 Swelling of the knee joint occurs in almost all patients with an ACL tear. This swelling is usually quite large, and occurs within minutes of the injury. Pain associated with an ACL tear is common, although can vary depending on the associated damage in and around the knee joint. Much of the pain of an ACL tear is due to swelling of the joint. A tear (sprain) occurs when the fibers of a ligament get stretched or torn, and this can generate various degrees of injury. The ACL is a very strong ligament, so considerable force is required to injure it. If the ACL becomes overstretched by a blow to the front of the knee, or a sudden stop and subsequent twisting movement, it may become torn. An ACL injury is known as a non-contact injury, as most of the injuries are caused by a sudden stopping movement or a pivoting motion where the knee isn't ready to absorb the force. Non-athletes are less prone to an ACL tear, but if a bad misstep, an accident in high heels, a slip and scramble to stay upright happens, a torn ACL may be the result. Grade 1 - minor trauma or a "sprain" to the ligament. Some ligament fibers are stretched but none are torn. Grade 2 - more severe trauma or "partial tear". Some fibers are torn, but completely ruptured. Grade 3 - Severe trauma to the ligament, which completely tears all the ligament's fibers. Also known as a "complete tear" or "rupture". Grade 3 represents the most severe ACL knee injury. Sports tape (which is also called kinesiology tape or athletic tape) can be applied to muscles, ligaments and tendons to provide extra protection and support. In the case of a torn ACL, sports tape will help prevent further injury and is an effective way to relieve swelling throughout the day. With or without surgery, recovery times can vary, but most people are back on their feet between six to ten months. The five phases of the recovery period are outlined below. Whether or not surgery was had, the below guidelines will help achieve the same goal. Yoga poses that will help strengthen everything from your calves to your core. Lie on your back. Bend both knees and walk your ankles directly beneath your knees keeping your feet straight. Extend your arms along your body, palms face down. Press evenly into the soles of your feet, lift your pelvis off the ground, walk your shoulder blades towards one another and underneath your back. Puff your chest towards your chin. Roll your thighs inward and down. Keep your knees stacked over your ankles throughout the duration of the exercise. Hold for 20 seconds. Add 10 seconds every other day until your reach one minute. Then, build to two minutes. Assume bridge position as described previously. Elevate one leg directly above your hip so that your foot points towards the ceiling. Hold for 20 seconds. Add 10 seconds every other day until you reach one minute. Stand with your legs one leg's distance apart, feet parallel. Pivot your right foot out to ninety degrees. Line your right heel up with your left arch. Engage your core by lifting your navel towards your chin. Keeping your chest and hips open, elevate your arms to shoulder height. Bend your right knee so that it stacks over your ankle. Hold for 10 breaths. Then straighten your leg making sure not to lock your knees and bend it again to come back to warrior. Repeat 10 times per side. Complete two sets. Lie down on your back, supporting yourself on your forearms. Bend your left leg and place the sole of your foot on the floor. Keeping it straight, elevate your right leg to the same height as the knee of the left making sure to isometrically hug your quads (upper thigh muscles) into your thighbone. Lower the leg to an inch above the ground and then repeat the lift. Do 25 of these and hold the last one for 10 seconds. Add 10 reps every other day until you reach 50 leg lifts with a hold of one minute at the end of each set. Tree - Stretches MCL of the bent knee, stabilizes the knee joint and strengthens the muscles surrounding the knee of the standing leg. Stand with your feet together, toes all facing forward, hands on hips. Elevate your right knee to hip height. Turn out your right hip and place the entire sole of your foot onto your left calf or inner thigh (grab your ankle to hike the foot up to the thigh). With an MCL tear, you might not be able to turn your hip/leg out a lot at first. Ease into this external rotation over time. It can take months to get a full turnout. Keep your gaze steady on a single focal point. Hold for five breaths. Build to 10 breaths and ultimately one minute. Repeat with the left leg. Lie down with your legs up the wall. Cross your ankle and bend your knees. Slide your heels up and down the wall working between flexion and extension. Do 20 reps. Complete 3 sets. Switch the crossing of your ankles and repeat. Sit with your legs straight in front of you. Keep your shoulders aligned over your waist and keep your spine tall. Gently press your legs against the ground and hug your quadriceps (thigh muscles) into your thighbone. Release your muscles to neutral. Do 20 reps. Complete three rounds. Very slowly test sitting back towards your heel and bringing your forehead to the floor. Hold yourself up with your hands to control how far you go. Stop when you feel any sign of slight discomfort. Over time, gradually increase your range lowering your buttocks closer to your heels. It can take many months to assume the full child's pose position. Stand with your feet together. Place your hands on your hips. Step your left foot back as you bend your right knee over your ankle. Straighten and bend your right kne every slowly, making sure not to lock the knee when you extend the leg. Repeat 10 times. Switch sides. Do three sets. You might be asking yourself who is King Brand, and why is their forum content so important. Well, here's why! King Brand takes pride in knowing that their products will help heal people, and they aren't afraid to show it. Their commitment to helping people heal naturally, is the pillar in which the company has grown on. The term BFST stands for Blood Flow Stimulation Therapy and it was created by King Brand Health Care. Blood flow is very important to help heal injuries, and after years of research and development they have come up with a product that does just what it says. No other company can match what King Brand does. They are the only company on the market that can directly target injuries at a cellular level with no surgery or doctors visits needed. Of course it's important to visit the doctor when you've injured yourself, but their treatment modalities can be done in the comfort of your own home.